Poetry is the most misunderstood form of writing. It is also arguably the purest form of writing. Poetry is a sense of the beautiful; characterized by a love of beauty and expressing this through words. It is art. Like art it is very difficult to define because it is an expression of what the poet thinks and feels and may take any form the poet chooses for this expression. 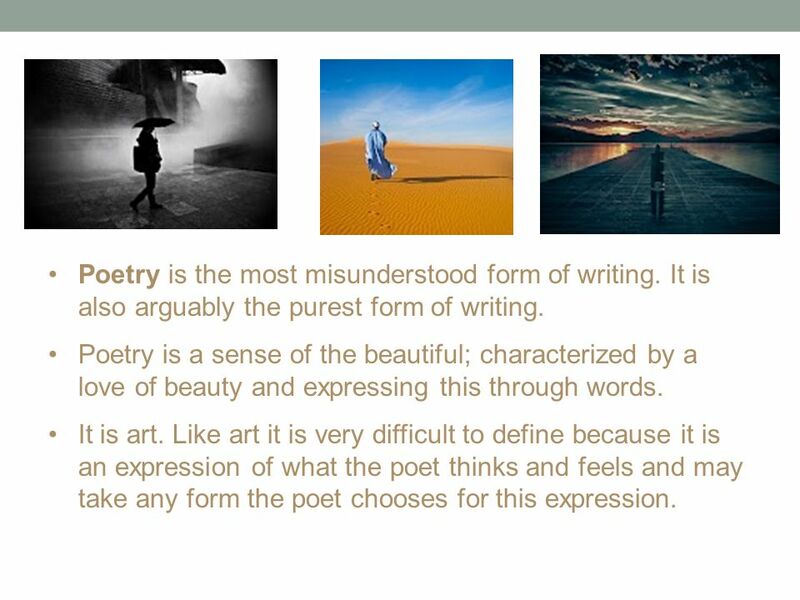 3 Definition of Poetry Poetry is not easily defined. 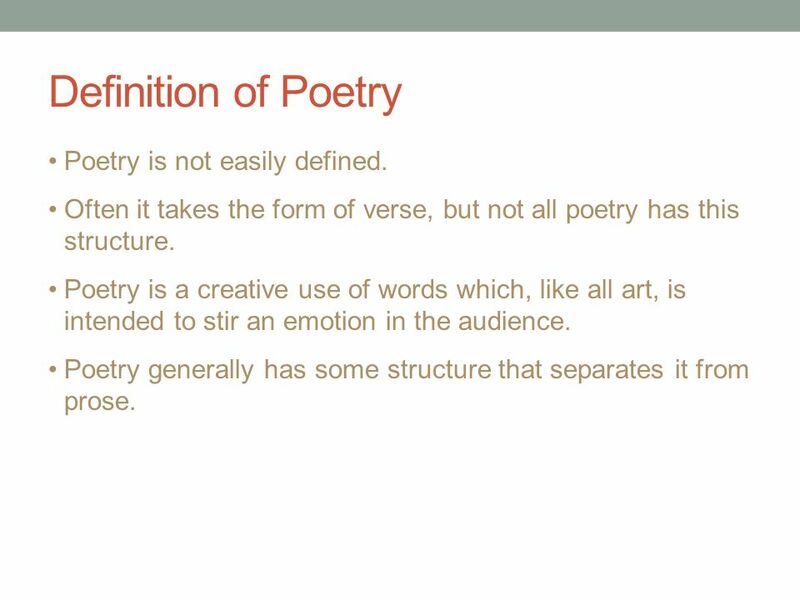 Often it takes the form of verse, but not all poetry has this structure. Poetry is a creative use of words which, like all art, is intended to stir an emotion in the audience. Poetry generally has some structure that separates it from prose. 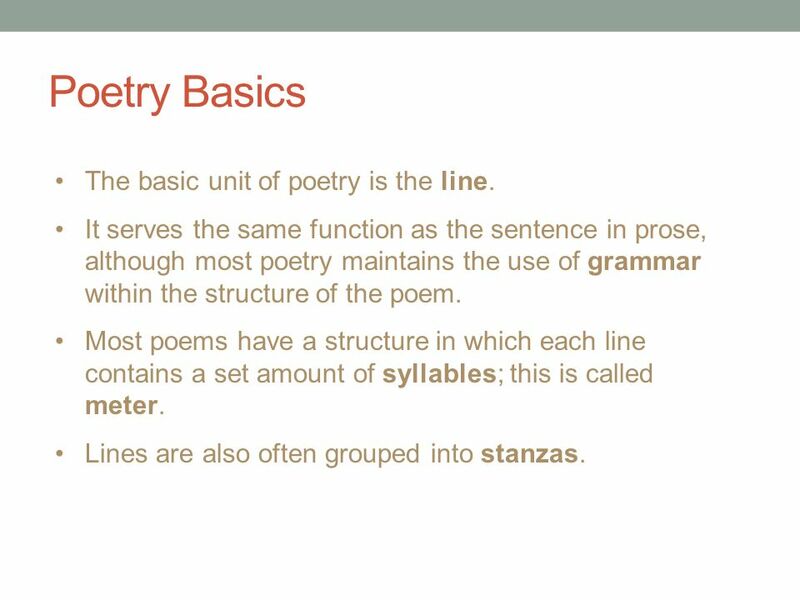 4 Poetry Basics The basic unit of poetry is the line. 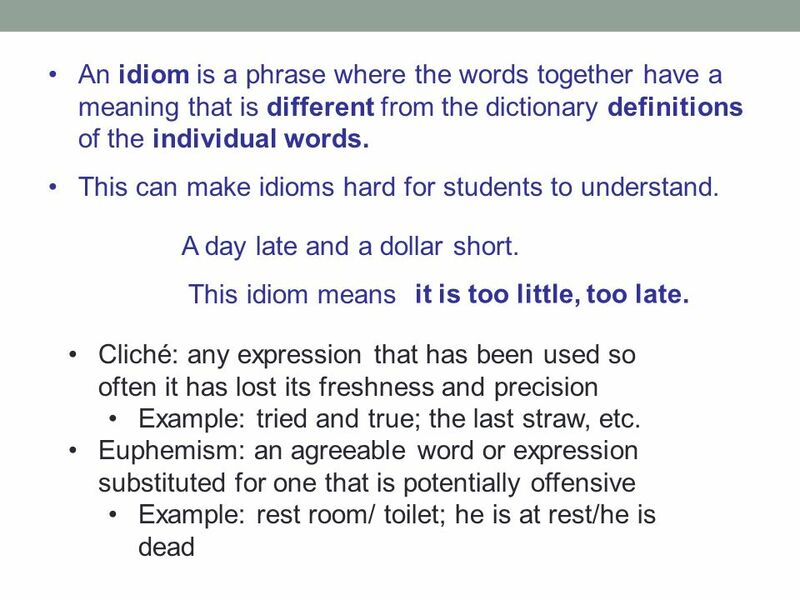 It serves the same function as the sentence in prose, although most poetry maintains the use of grammar within the structure of the poem. 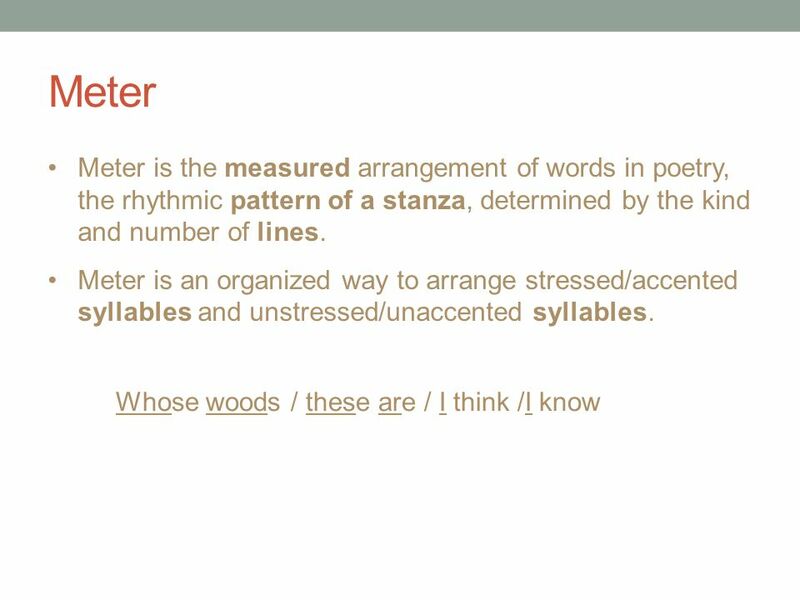 Most poems have a structure in which each line contains a set amount of syllables; this is called meter. 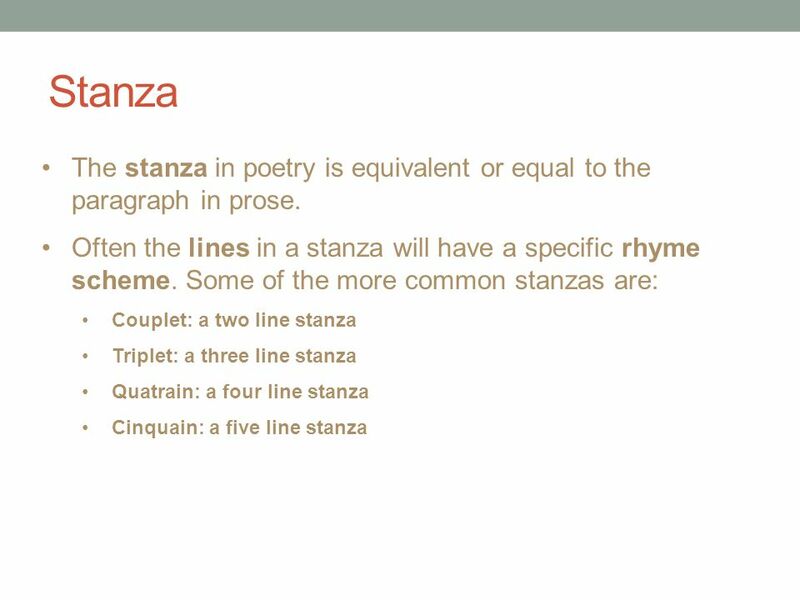 Lines are also often grouped into stanzas. 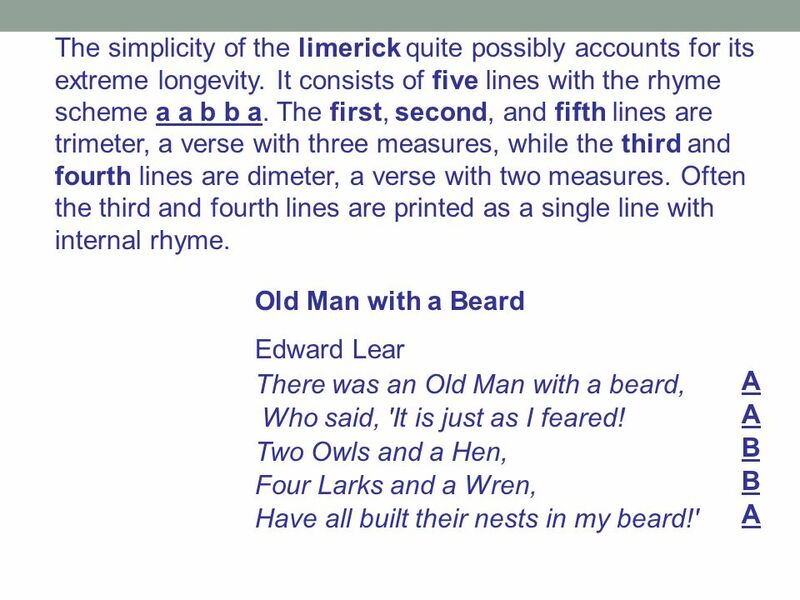 The length of a line of poetry is measured in metrical units called “FEET”. Each foot consists of one unit of rhythm. 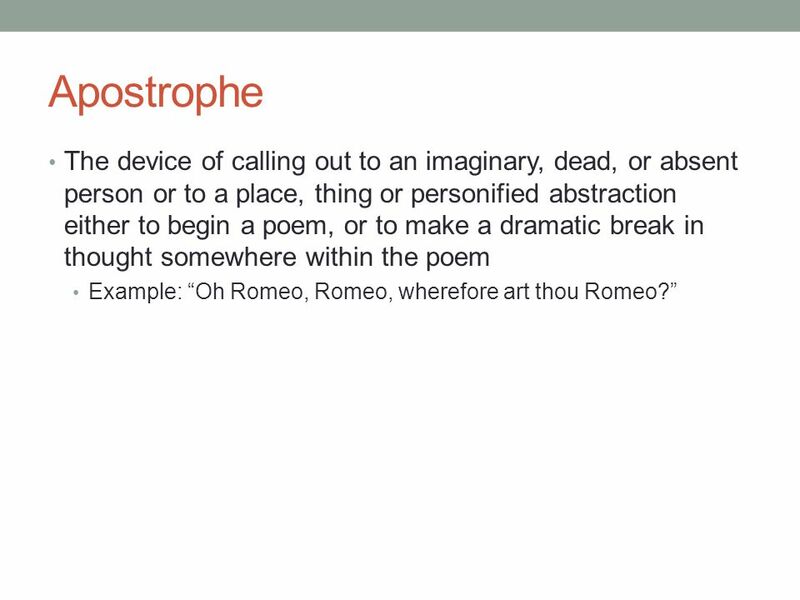 So, if the line is iambic or trochaic, a foot of poetry has 2 syllables. 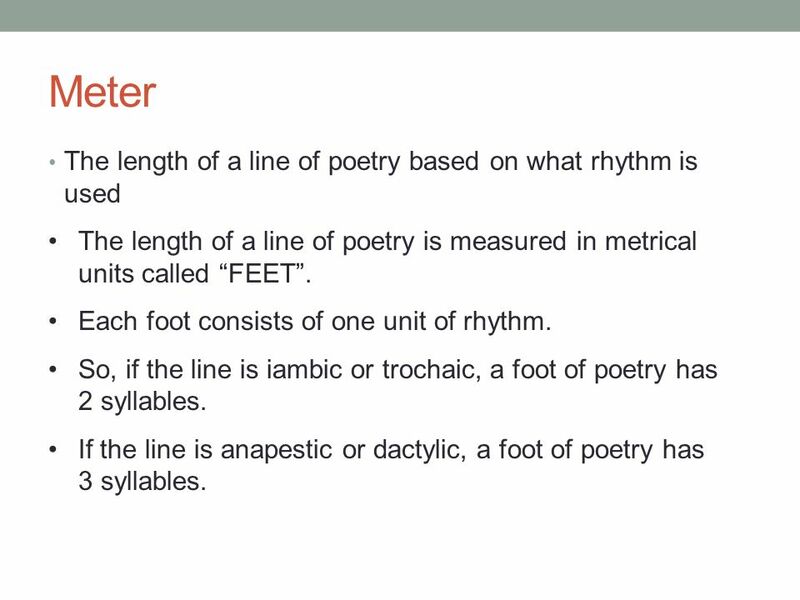 If the line is anapestic or dactylic, a foot of poetry has 3 syllables. 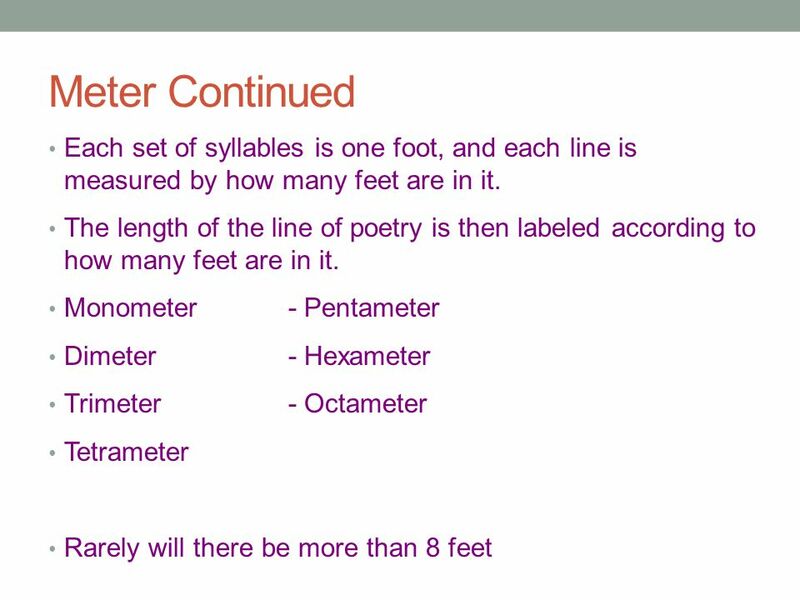 11 Count the syllables in each line to determine the meter. She Walks in Beauty She walks in beauty, like the night Of cloudless climes and starry skies; And all that’s best of dark and bright Meet in her aspect and her eyes: Thus mellowed to that tender light Which Heaven to gaudy day denies. 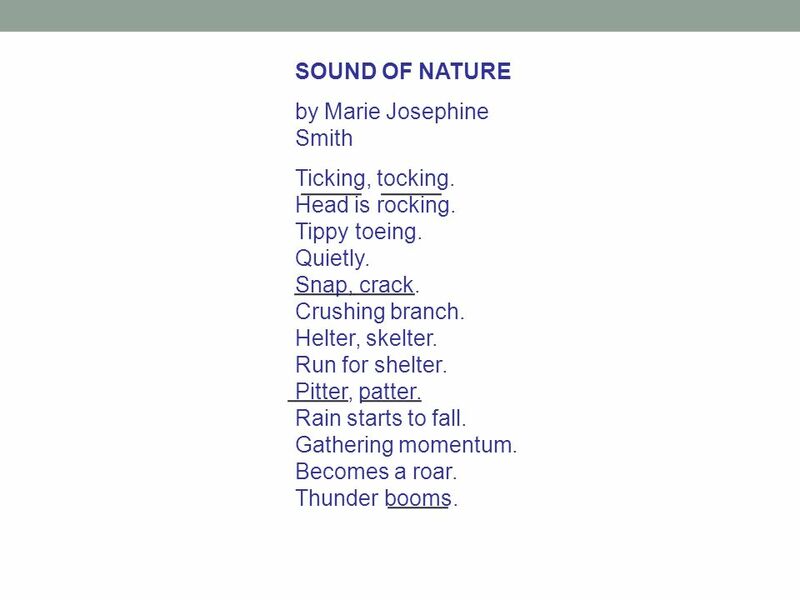 Reading this poem out loud makes the rhythm evident. Which syllables are more pronounced? Which are naturally softer? ˘ ΄ ˘ ΄ ˘ ΄ ˘ ΄ One shade the more, one ray the less, Had half impaired the nameless grace Which waves in every raven tress, Or softly lightens o’er her face; Where thoughts serenely sweet express, How pure, how dear their dwelling-place. 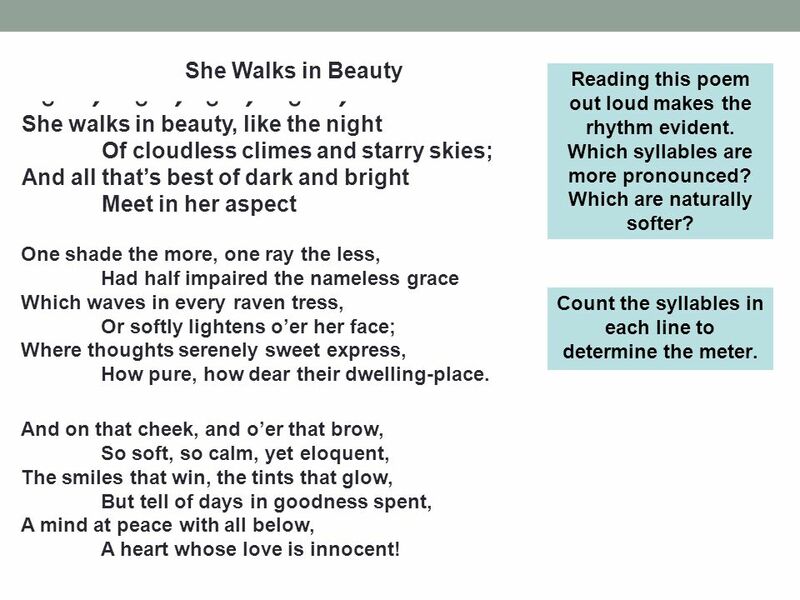 Count the syllables in each line to determine the meter. And on that cheek, and o’er that brow, So soft, so calm, yet eloquent, The smiles that win, the tints that glow, But tell of days in goodness spent, A mind at peace with all below, A heart whose love is innocent! 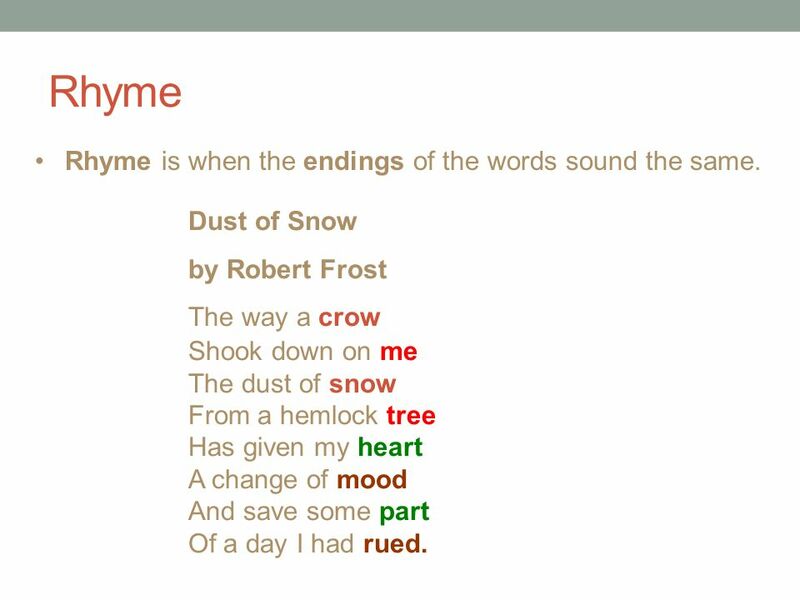 12 Rhyme Rhyme is when the endings of the words sound the same. Dust of Snow by Robert Frost The way a crow Shook down on me The dust of snow From a hemlock tree Has given my heart A change of mood And save some part Of a day I had rued. 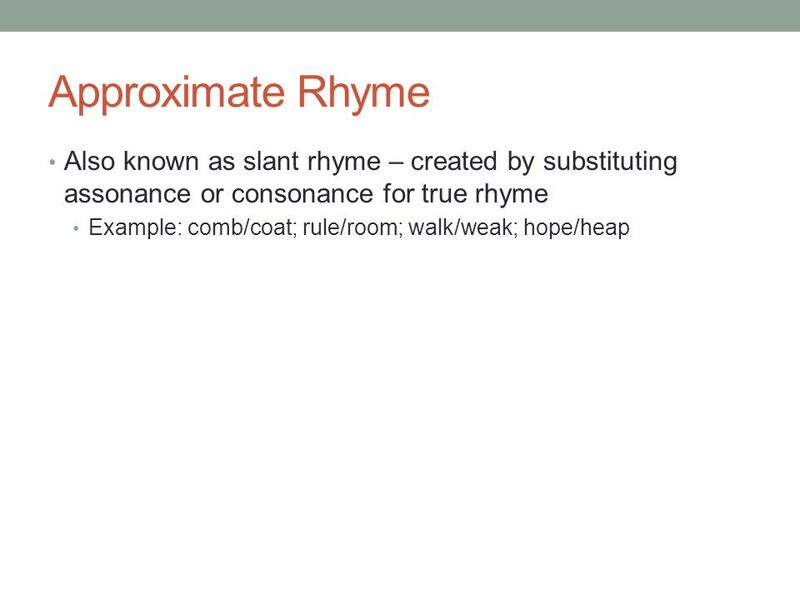 13 Rhyme scheme is the pattern of rhyming words at the end of each line. 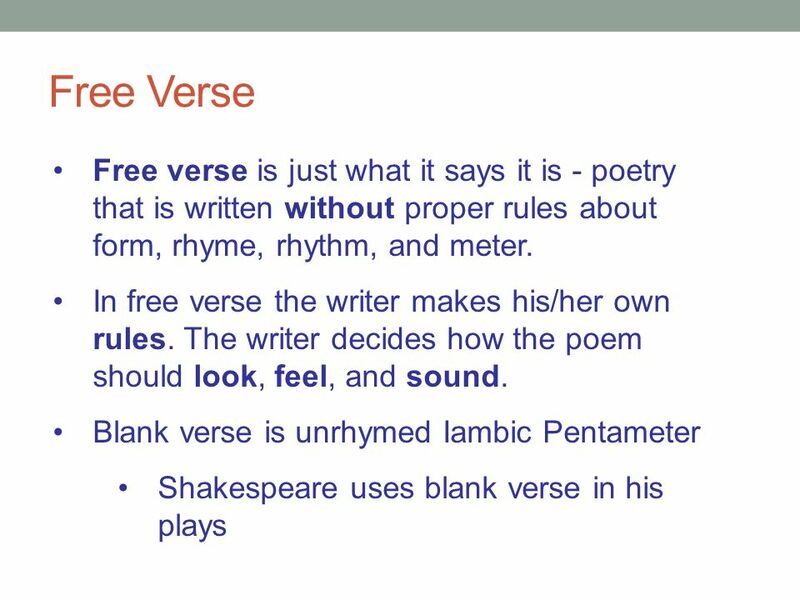 Not all poetry has a rhyme scheme. 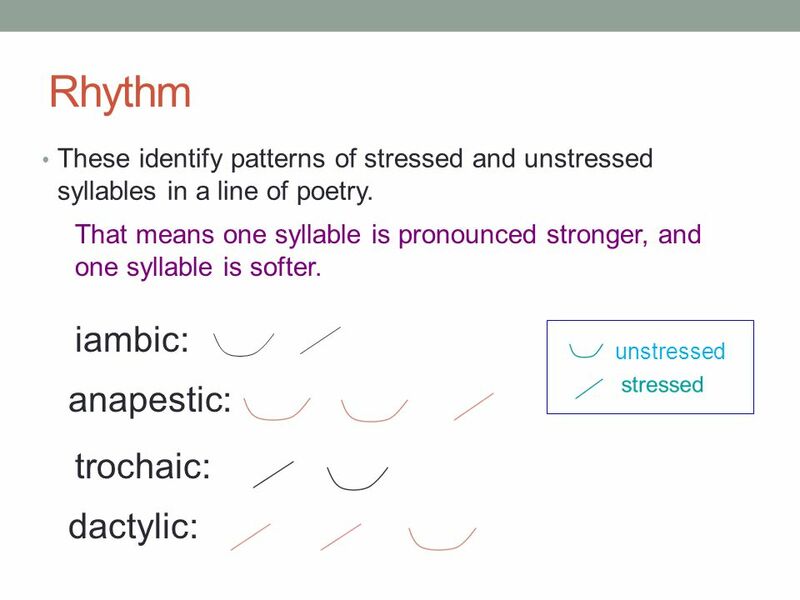 They are not hard to identify, but you must look carefully at which words rhyme and which do not. 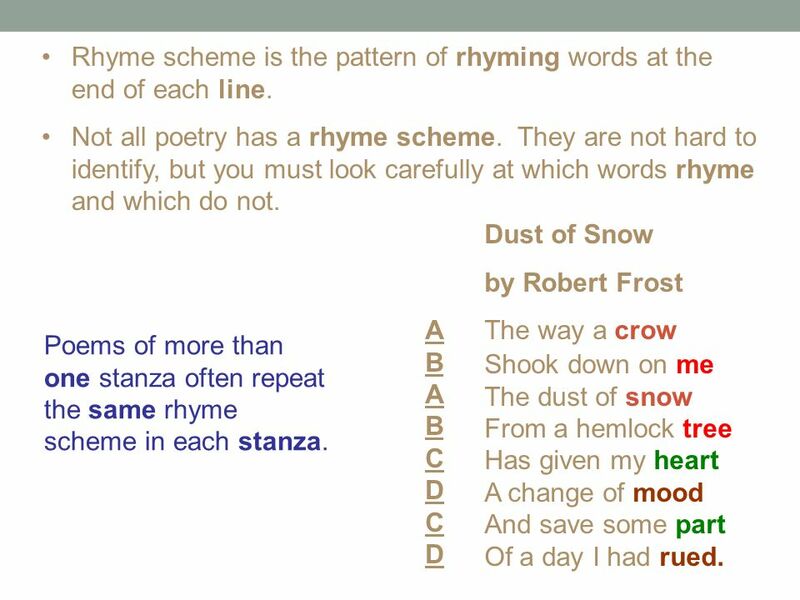 Dust of Snow by Robert Frost The way a crow Shook down on me The dust of snow From a hemlock tree Has given my heart A change of mood And save some part Of a day I had rued. 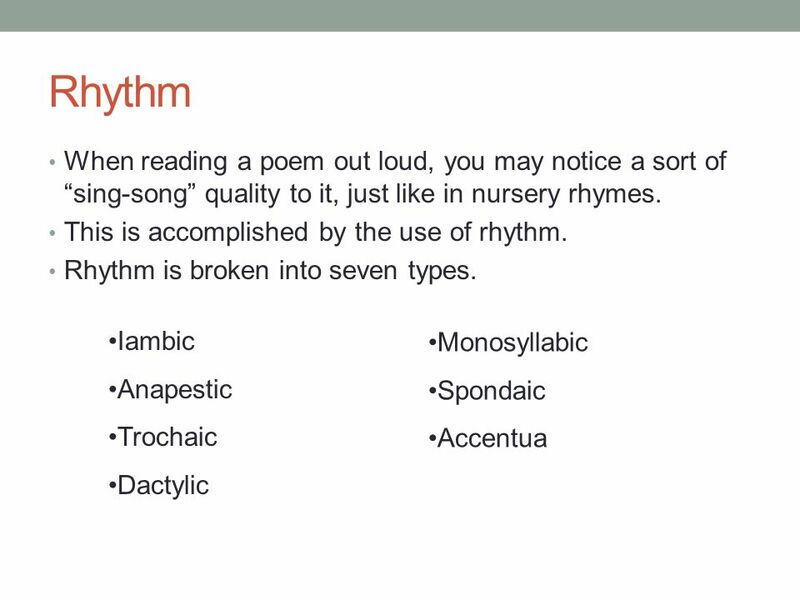 A B C D Poems of more than one stanza often repeat the same rhyme scheme in each stanza. 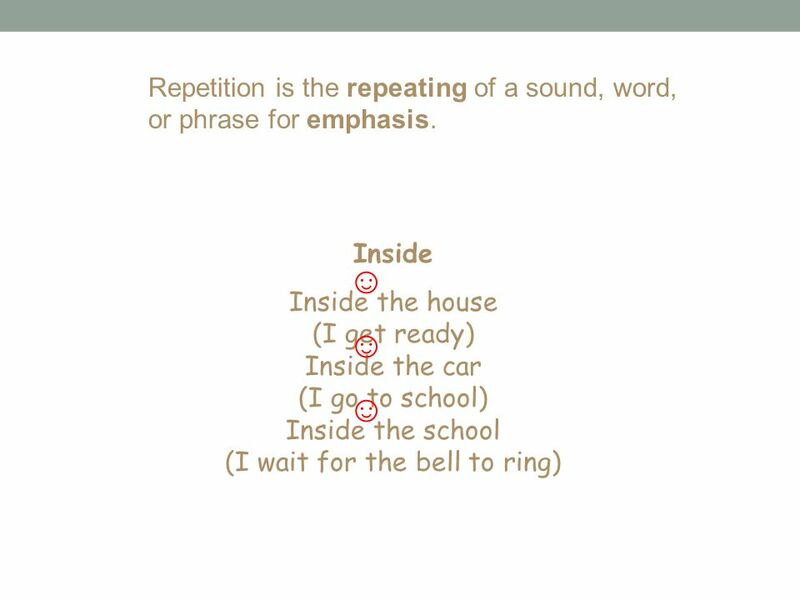 16 Repetition is the repeating of a sound, word, or phrase for emphasis. 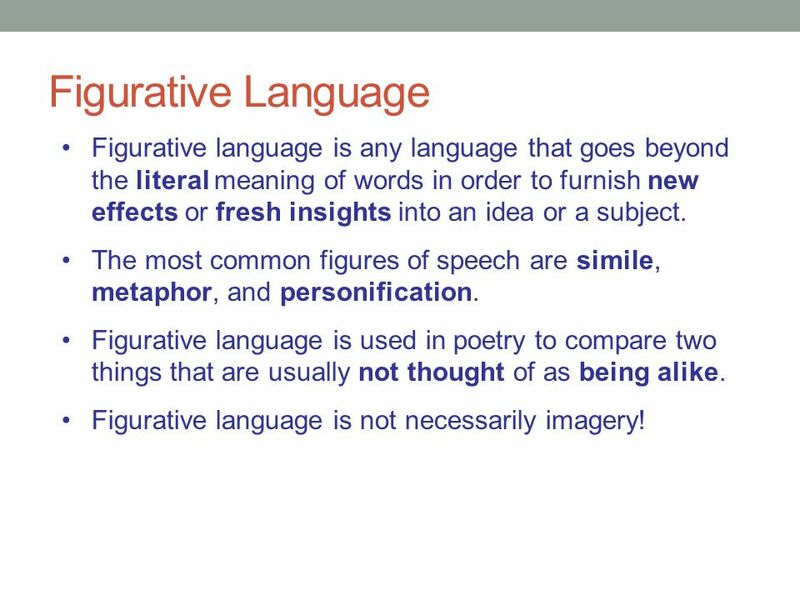 17 Figurative Language Figurative language is any language that goes beyond the literal meaning of words in order to furnish new effects or fresh insights into an idea or a subject. 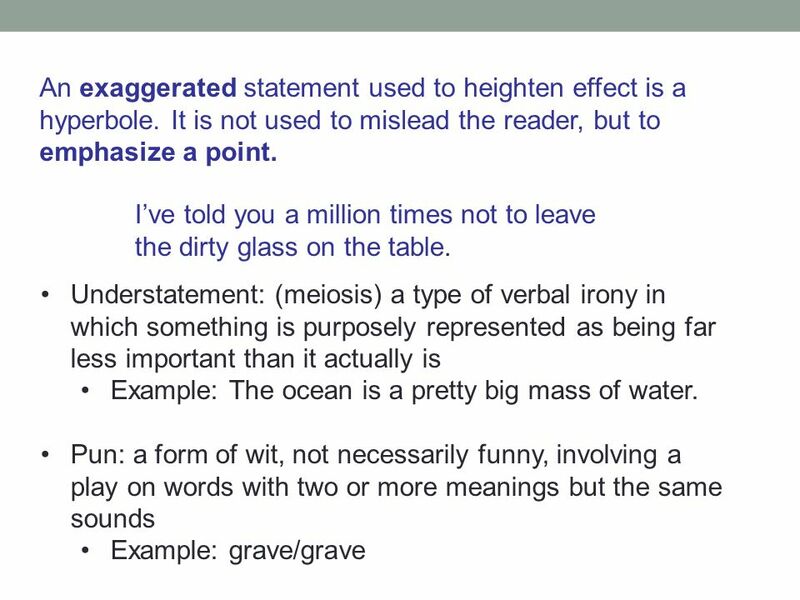 The most common figures of speech are simile, metaphor, and personification. 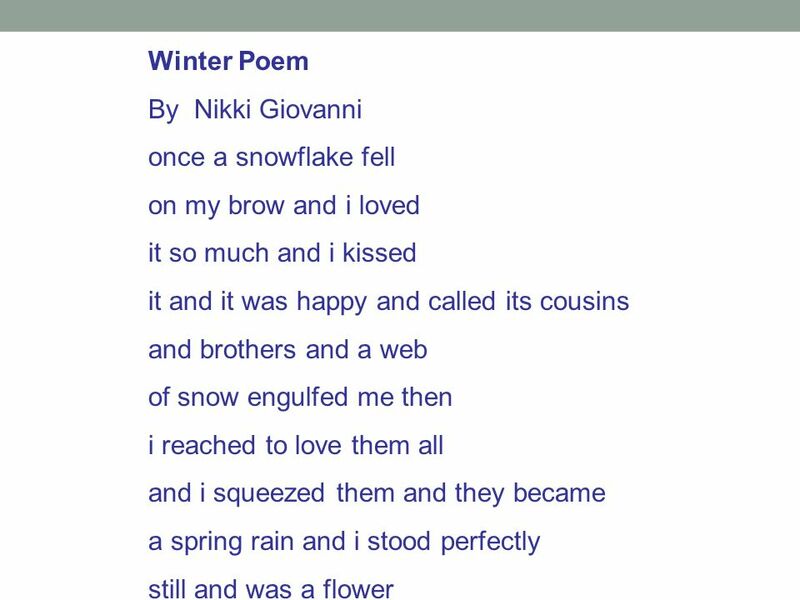 Figurative language is used in poetry to compare two things that are usually not thought of as being alike. 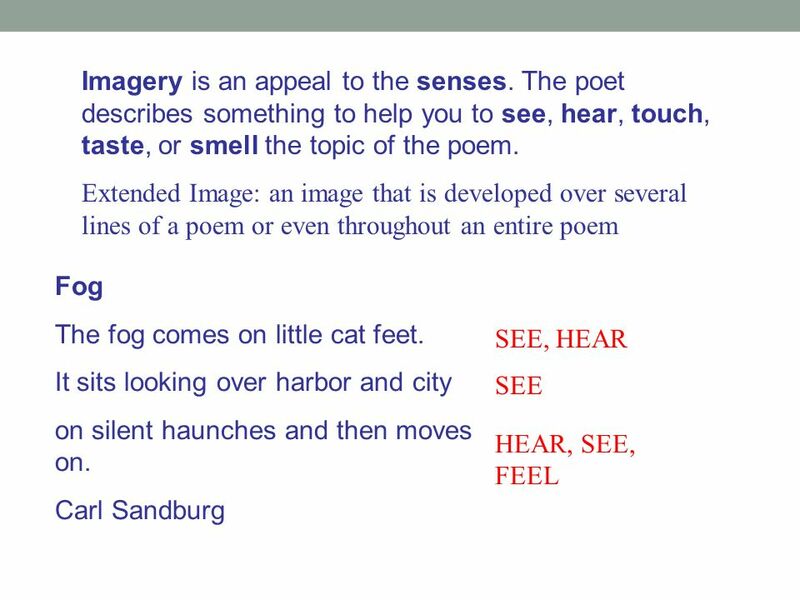 Figurative language is not necessarily imagery! 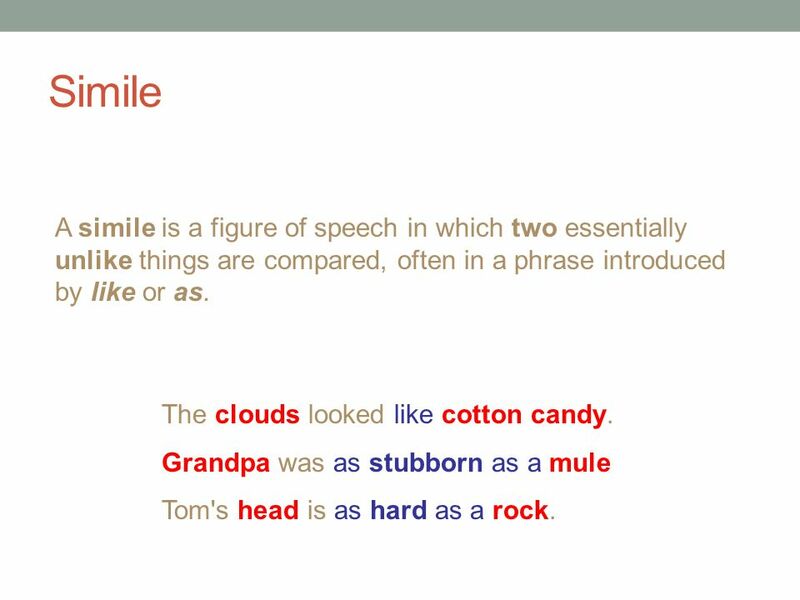 18 Simile A simile is a figure of speech in which two essentially unlike things are compared, often in a phrase introduced by like or as. The clouds looked like cotton candy. Grandpa was as stubborn as a mule Tom's head is as hard as a rock. 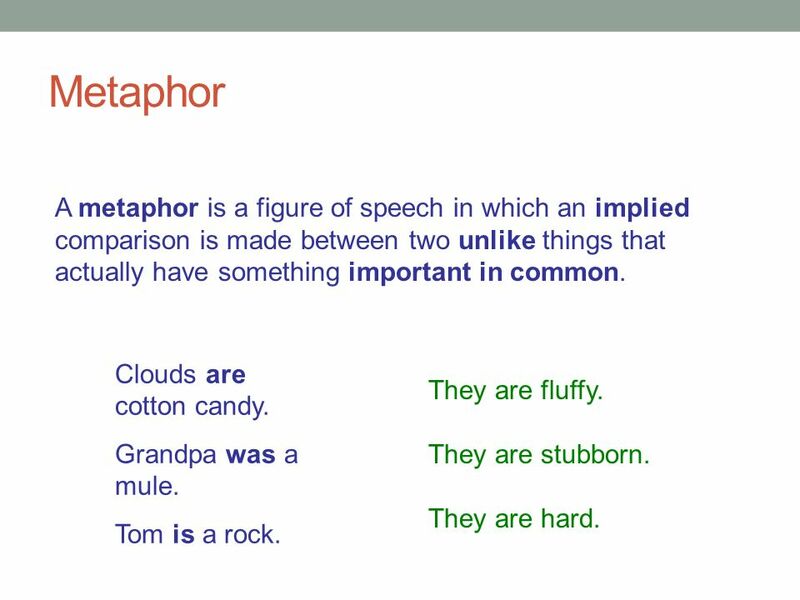 19 Metaphor A metaphor is a figure of speech in which an implied comparison is made between two unlike things that actually have something important in common. Clouds are cotton candy. Grandpa was a mule. Tom is a rock. They are fluffy. They are stubborn. They are hard. 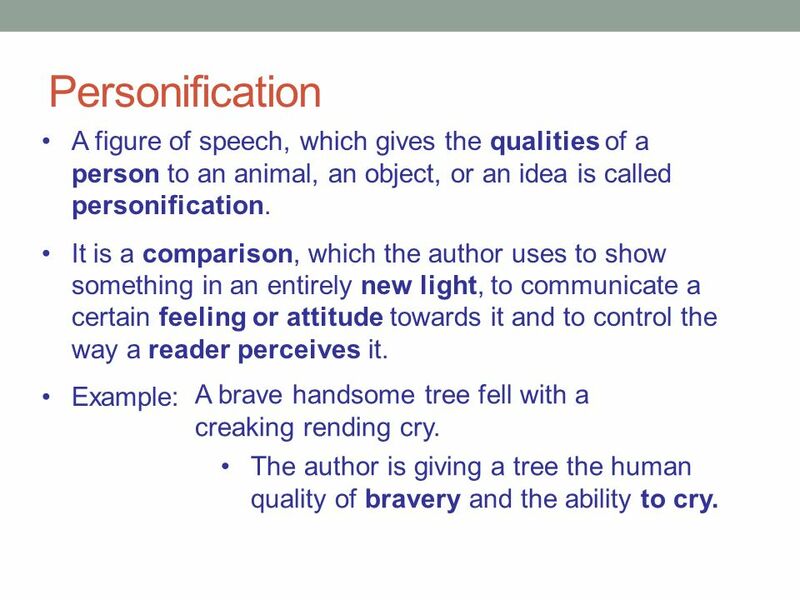 20 Personification A figure of speech, which gives the qualities of a person to an animal, an object, or an idea is called personification. It is a comparison, which the author uses to show something in an entirely new light, to communicate a certain feeling or attitude towards it and to control the way a reader perceives it. Example: A brave handsome tree fell with a creaking rending cry. The author is giving a tree the human quality of bravery and the ability to cry. 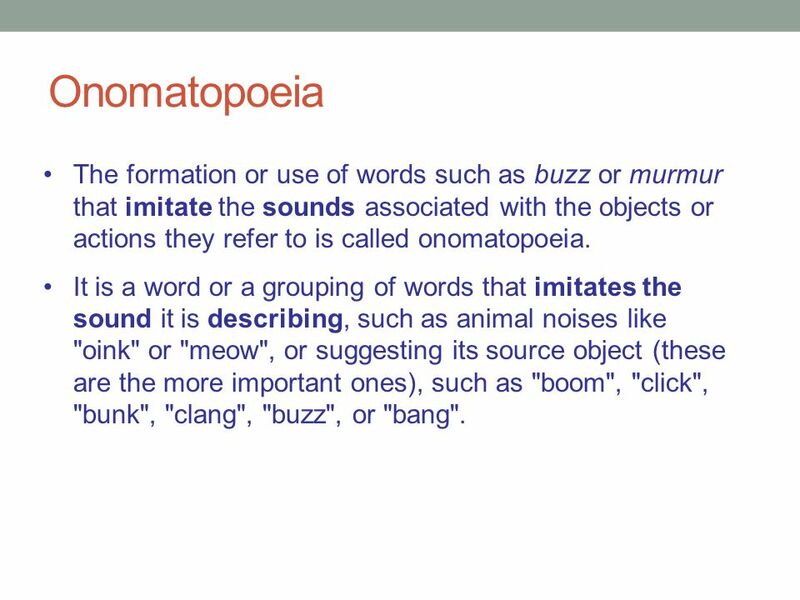 24 Onomatopoeia The formation or use of words such as buzz or murmur that imitate the sounds associated with the objects or actions they refer to is called onomatopoeia. It is a word or a grouping of words that imitates the sound it is describing, such as animal noises like "oink" or "meow", or suggesting its source object (these are the more important ones), such as "boom", "click", "bunk", "clang", "buzz", or "bang". 30 Haiku Haiku is one of the most important forms of traditional Japanese poetry. 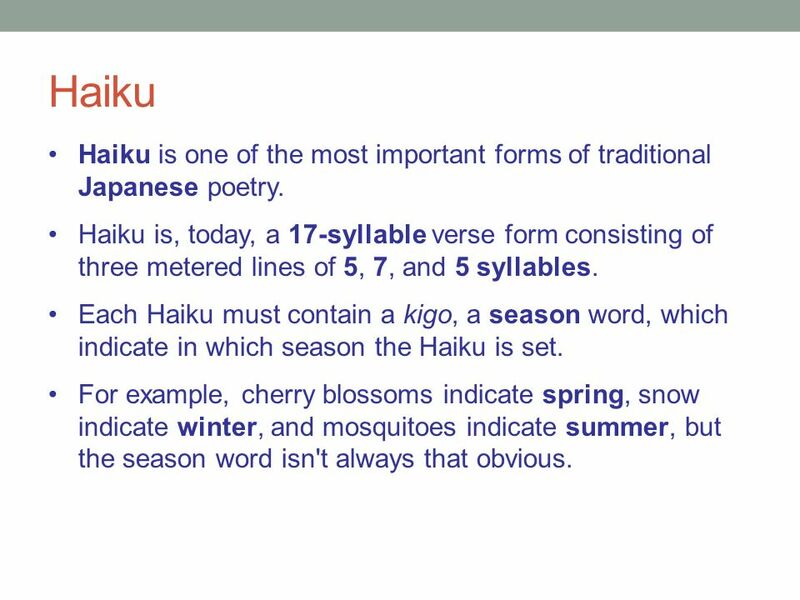 Haiku is, today, a 17-syllable verse form consisting of three metered lines of 5, 7, and 5 syllables. Each Haiku must contain a kigo, a season word, which indicate in which season the Haiku is set. For example, cherry blossoms indicate spring, snow indicate winter, and mosquitoes indicate summer, but the season word isn't always that obvious. 31 Haikus By Paul McCann Fog On the mountain top The fog fell down thick and fast It was like pea soup. Rain Tip-tap goes the rain. As it hits the window pane I can hear the rain. Hail They fell in showers. Like diamonds upon the ground Big hailstones were found. 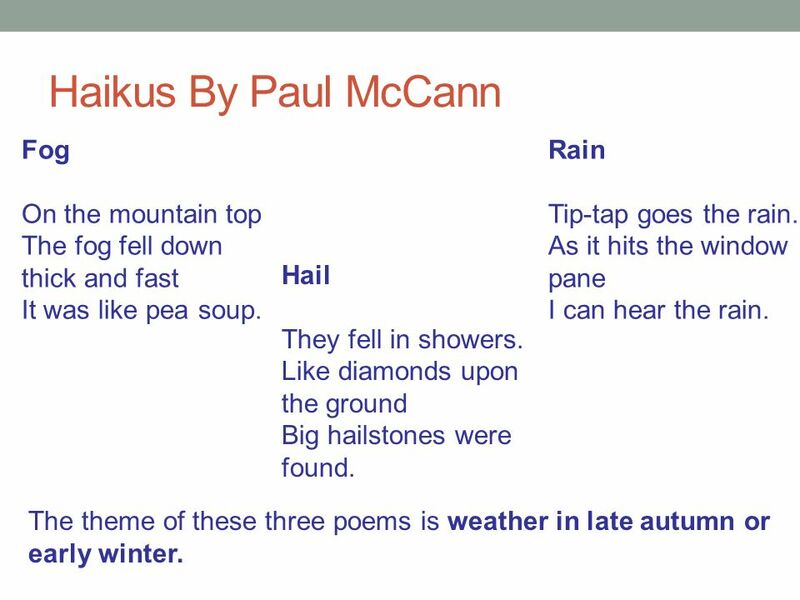 The theme of these three poems is weather in late autumn or early winter. 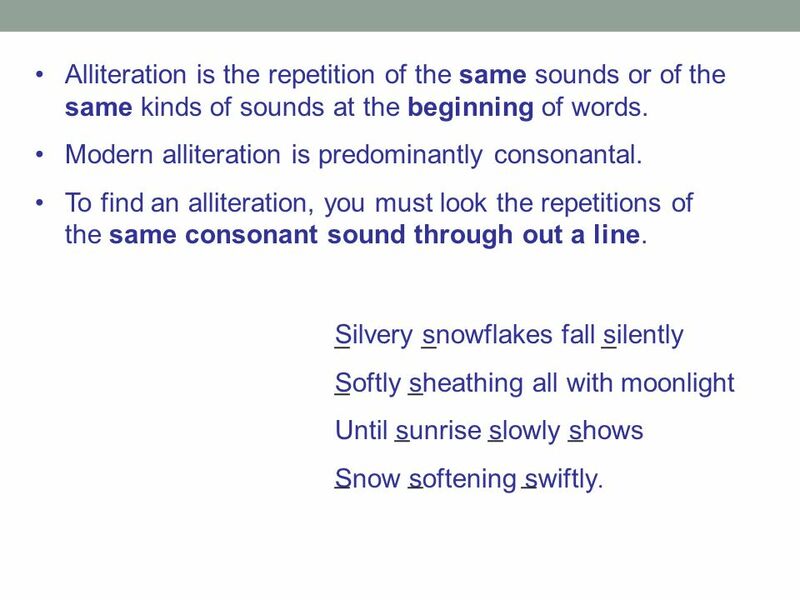 33 A narrative poem, often of folk origin and intended to be sung, consisting of simple stanzas and usually having a refrain. 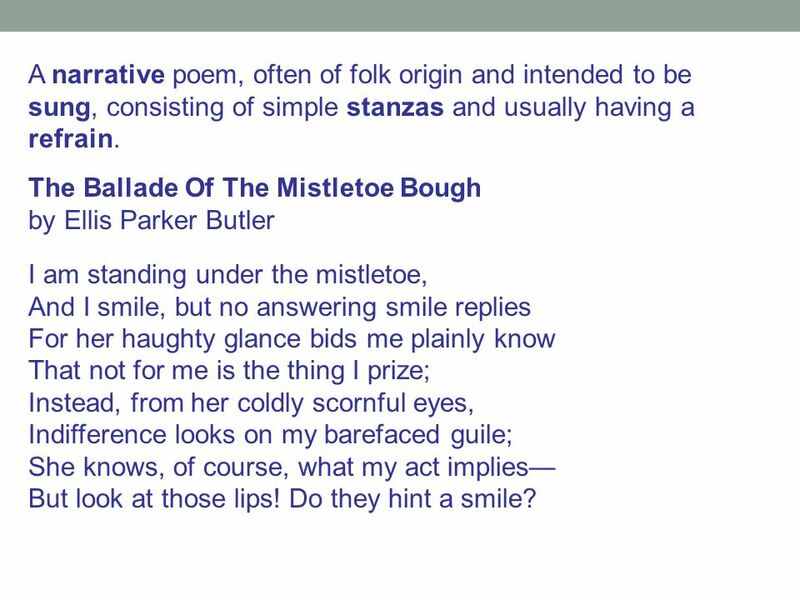 The Ballade Of The Mistletoe Bough by Ellis Parker Butler I am standing under the mistletoe, And I smile, but no answering smile replies For her haughty glance bids me plainly know That not for me is the thing I prize; Instead, from her coldly scornful eyes, Indifference looks on my barefaced guile; She knows, of course, what my act implies— But look at those lips! Do they hint a smile? 34 I stand here, eager, and beam and glow, And she only looks a refined surprise As clear and crisp and as cold as snow, And as—Stop! I will never criticize! I know what her cold glance signifies; But I’ll stand just here as I am awhile Till a smile to my pleading look replies— But look at those lips! Do they hint a smile? Just look at those lips, now! 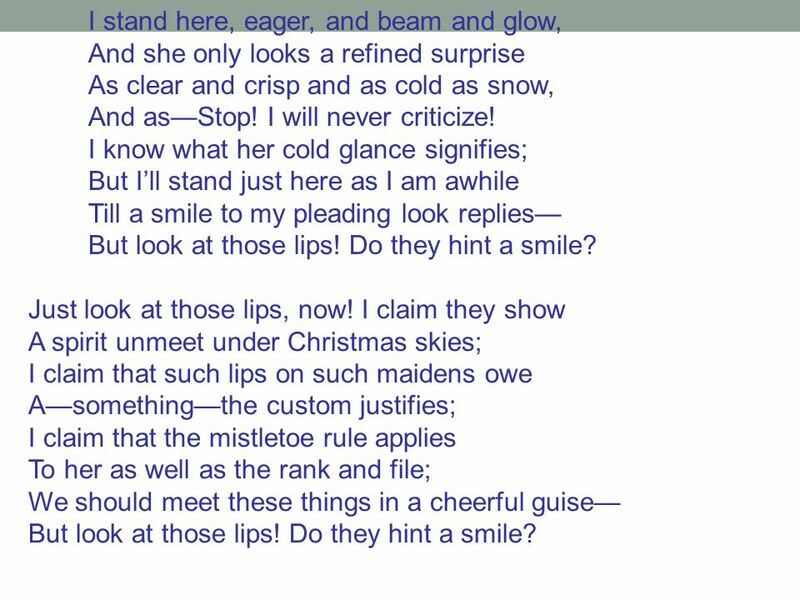 I claim they show A spirit unmeet under Christmas skies; I claim that such lips on such maidens owe A—something—the custom justifies; I claim that the mistletoe rule applies To her as well as the rank and file; We should meet these things in a cheerful guise— But look at those lips! Do they hint a smile? 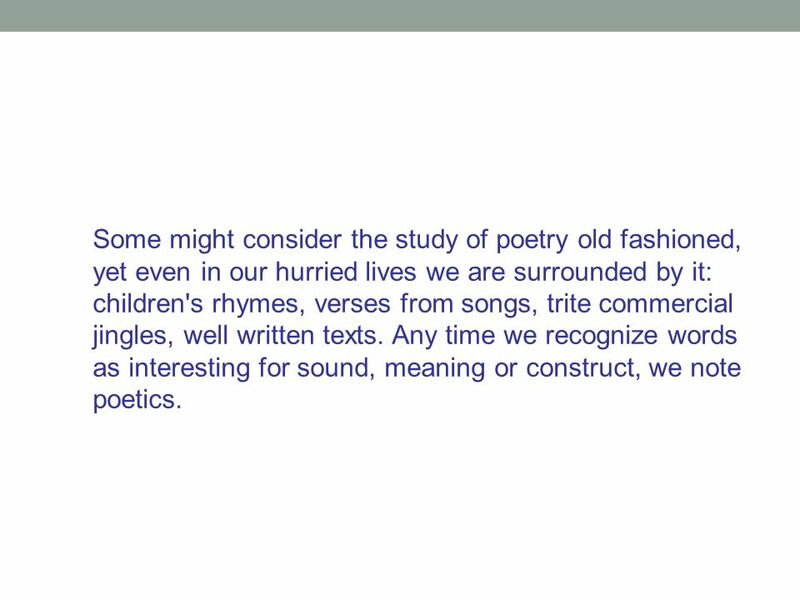 35 Some might consider the study of poetry old fashioned, yet even in our hurried lives we are surrounded by it: children's rhymes, verses from songs, trite commercial jingles, well written texts. 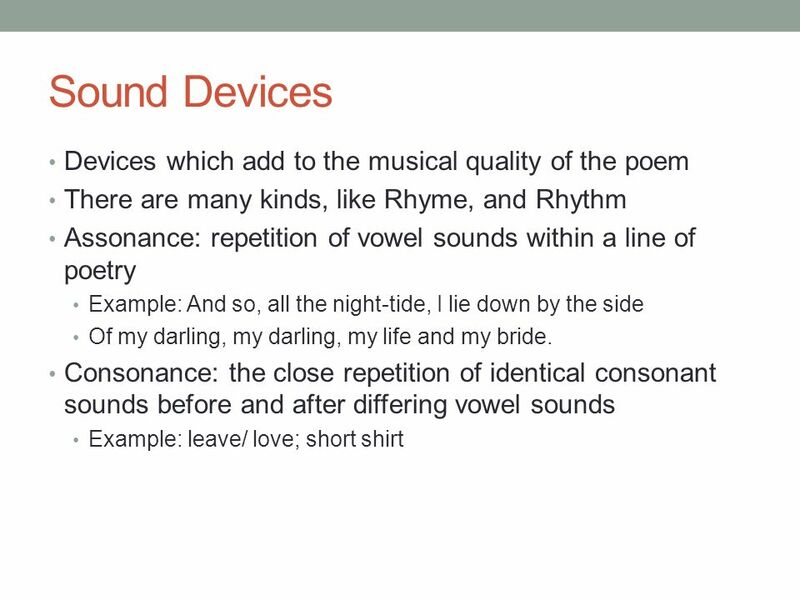 Any time we recognize words as interesting for sound, meaning or construct, we note poetics. 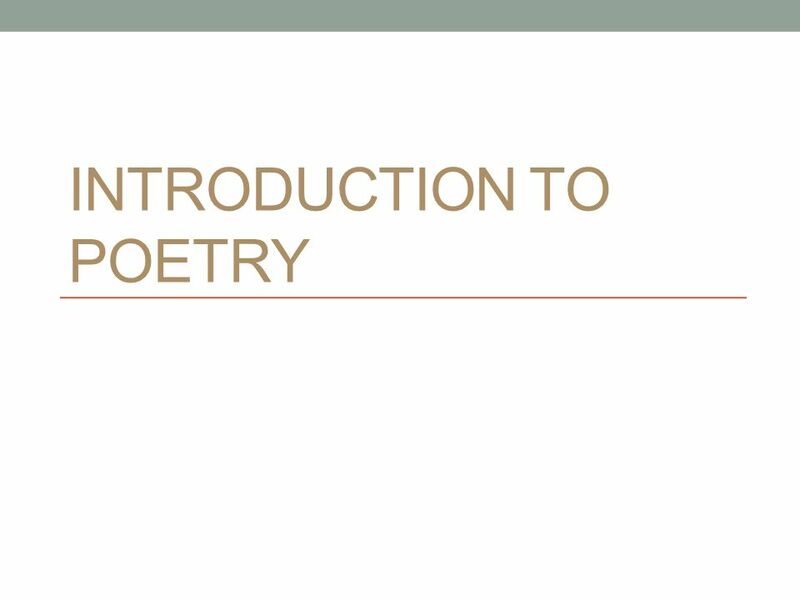 Download ppt "Introduction to Poetry"
Monday, November 14, 2011 Bell Ringer What is your definition of poetry? What do you like or not like about poetry? Please explain.